On Sunday, March 22, work resumed. 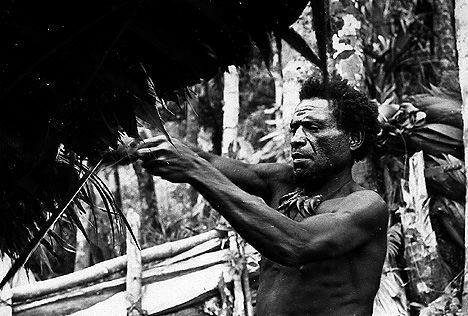 As before, not only local men participated, but also men from neighboring clans - the Koramas, the Bomagais, and the Angoians. All of them had had to walk for at least an hour to reach Gunts. The people of the Korama clan lived on the west side of the Rigahn River and had to go down to the crossing before tackling the extremely steep ascent. This was a trip which we ourselves tried to make as infrequently as possible, but one which in no way discouraged them. 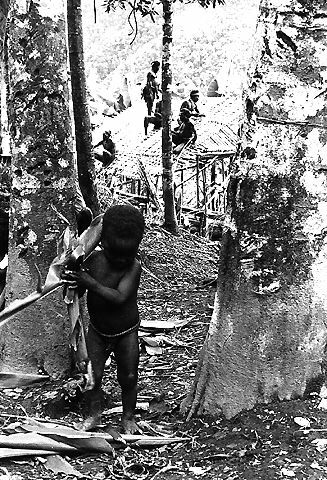 Many people who lived in the Korama settlement of Gembiama thought nothing of making the trip back and forth several times a week. Even the older man with a crooked foot, visible in the lower left-hand corner of the photograph (008:24), was a frequent visitor to Gunts. The Bomagais and Angoians had no such steep slopes to cross, but they had further to walk, as they lived at the extreme eastern end of the Maring territory. 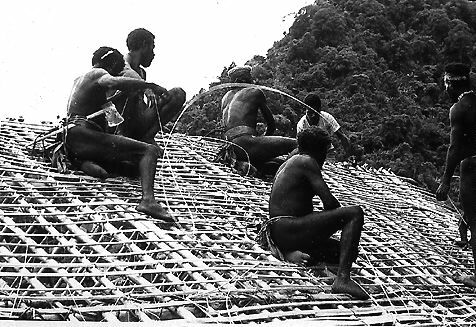 Since the structural poles had already been put up, the next thing to do was to place the bamboo rafters. These were long enough to extend from one side of the house to the other and could be easily bent in the middle where they crossed the ridge pole. 008-24: The bamboo rafters are bent across the ridge pole. Getting onto the roof was easy. Men either shinnied up a pole or they walked up forked trunks which had been placed at a diagonal against one of the side beams. It was just as Bossboy Gul had said: since the walls were a great deal higher than local houses, much more wall-covering material than usual was needed. One of the young Angoian men arrived with a large bundle of long leaves from the pandanus variety called miom. This was the material traditionally used, as it could easily be hung over laths bound to the walls. 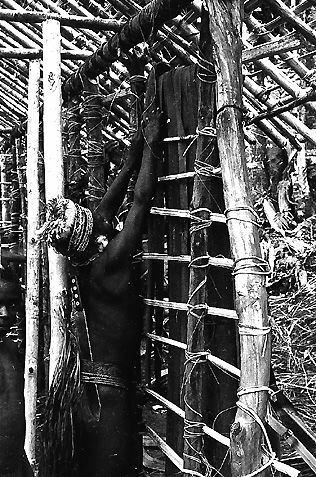 Traditional Maring architecture relied upon lianas and long strips of split bark to bind the various other materials together in a flexible and strong structure. 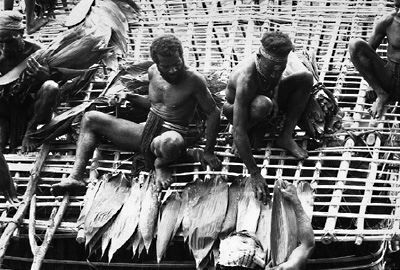 No matter which variety of plant was used, the binding material itself was called gaua. 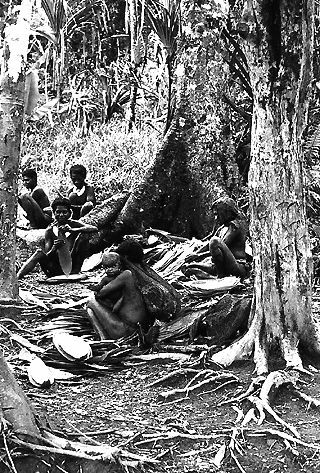 Gaua was a word which we came to know well, as it was frequently used, not only in conversations regarding the building of the house, but also regarding the hand-made twine which women produced to make clothing and string bags. 009-01: The miom leaves are hung over wall strips. 008-26: Above, on the roof, men bound laths of split bamboo onto the rafters. At this stage we found out that women had a large part to play in the building of any house. 008-30: Women prepare leaves for thatching. 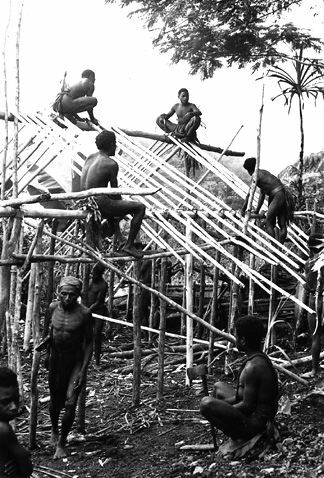 The women were the ones principally responsible for preparing the thatching materials. 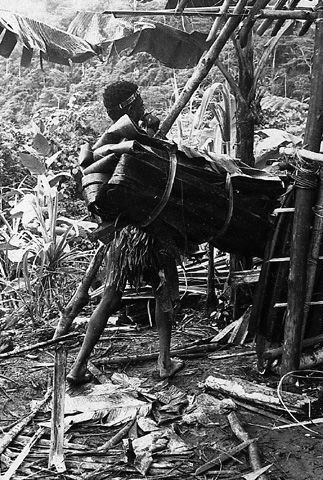 While the men had been harvesting the poles, lianas, and pandanus leaves from the forest, women had been collecting leaves. Now they gathered in the grove of trees straddling the Kiap Road, just uphill from Gunts Yard. While talking and looking after their babies, they worked with the leaves. They placed the leaves together, two by two, splitting the central spine of one free and piercing it through the other, forming a leaf pair. Using the free spine, these leaf pairs were later securely hooked over the laths. 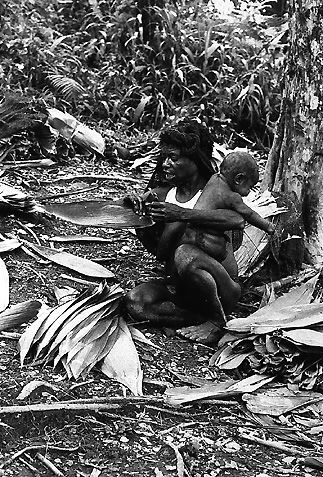 008-33: A Bomagai woman prepares leaf pairs. 008-34: Para plays with leaves. The Jablonkos' house is in the background. From where they were sitting, the women could see down to the building site, and toddlers could walk back and forth between their fathers and their mothers. Armloads of completed leaf pairs were carried down to the house and the men began to place them, starting from the edges of the roof and working upward. 009-16: Numbi and Nakemba place the first row of thatching leaves. 010-17: Stooping on window ledge, a man continues to bind leaves on the inside of the wall. At the end of the long day of work Gul cut the thatch above the door. 010-20: Gul cuts the thatch above the door. We were very eager to move in, but the inner surfaces still had to be finished. By now we had learned that there was no way we could hurry the process along. We had drawn a design which would take up the least space possible, yet allow us the most space for our work. The bed surface would double as table surface during the day. 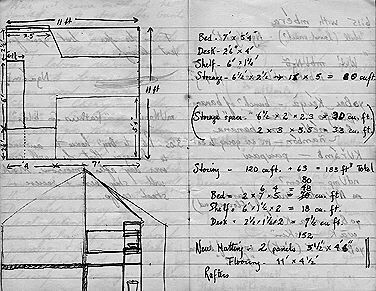 Storage shelves lined the south side of the house, and a narrow desk ran along the north side. There was just space for a cooking surface on the west side . All these surfaces were to be constructed out of lengths of w bound closely together onto saplings which had, like the house posts, been driven into the bare earth. 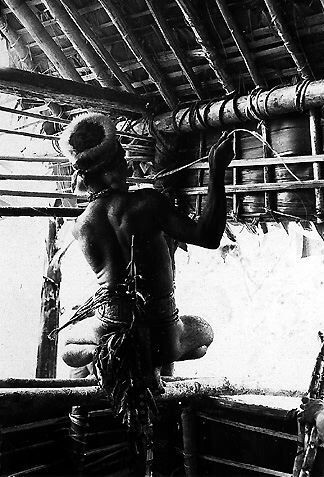 Once the "furniture" was complete, the earthen floor where we had to walk was covered with split bamboos woven together. The floor of the enclosed shower space in the southwest corner was lined with large smooth stones, to allow the water to run off without creating mud. By March 27, we were able to sleep in our house and to unpack our film. We set about to use our home and office with much enthusiasm.